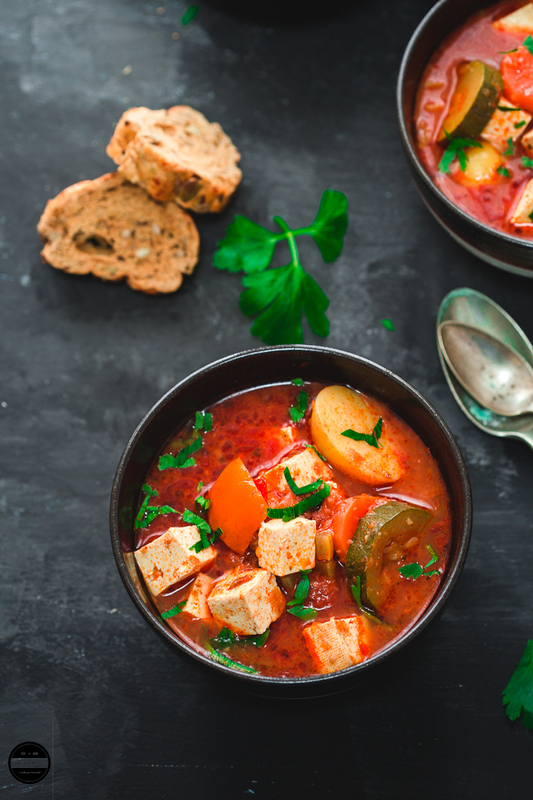 This hearty and comforting Vegan Hungarian Goulash is an easy, healthy and tasty recipe that can be a great cozy winter treat or in my case all year around! 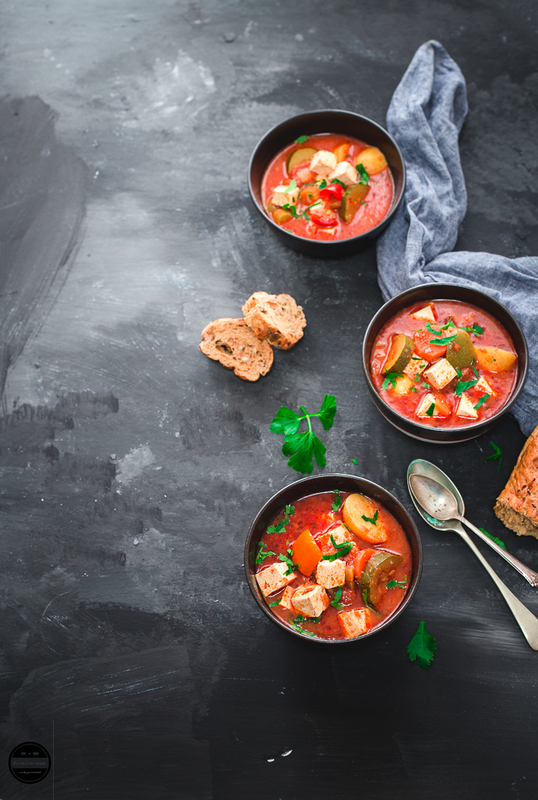 A vegan take on the traditional Hungarian Goulash prepared in a rich and delicious tomato base with chunky vegetables and Tofu with lots of sweet Hungarian paprika! You must be thinking, why on earth she is posting a winter recipe around this time? Well, let me tell an interesting fact! One of my friends from Hungary told me that Goulash is better in winter, but usually, in Hungary, people eat Goulash throughout the year, and it always tastes good. I wasn't familiar with the Goulash recipe until our guide mentioned to us while we were on a trip to Budapest. A young lovely girl was our guide in Budapest and while she was giving all the important information about Hungary and especially Budapest, she said that Goulash is one of the national dishes of Hungary and a symbol of the country and is made with non-veg ingredients and served with a dollop of sour cream. As soon as I heard the word food, I was all ears! She asked us if we wanted to have lunch in Budapest if so she can take us to a particular restaurant and we all can have our early lunch there and can try Goulash. We got excited and put our hands up for booking a table, and asked her will it be a vegetarian version of Goulash? She called the restaurant and asked them, the reply was disappointing. Their reply was that there is no vegetarian or vegan Goulash, but they have many other vegetarian and vegan dishes that we can have. Straight away I searched on Google for a recipe of vegetarian Goulash, thousands of results were to choose from. I told myself, as soon as I'll reach home first recipe I will try that would be a Vegetarian Goulash. Quickly searched online about GOULASH while in a coach, ( Thank God, for all these amazing gadgets and latest technology) soon came to know that there are many versions of GOULASH out there as every region has their own recipes which are all unique. Also checked out which particular ingredients I need to cook Goulash with, so I can buy it from Budapest and there was an ingredient called Sweet Hungarian Paprika which is the star of the recipe! Yes, to achieve that good taste, Hungarian Paprika is essential for this recipe. I picked up a jar! A recipe that takes a bit of time, but it cooks itself, almost every other weekend this healthy, one-pot wonder and the nutritious stew appears on our table. It is sure to satisfy everyone's cravings. This recipe is not an authentic one. Because we all liked it so much, this time I made a double batch! You can adjust the spiciness of this stew and add whatever seasonal vegetables you can find. 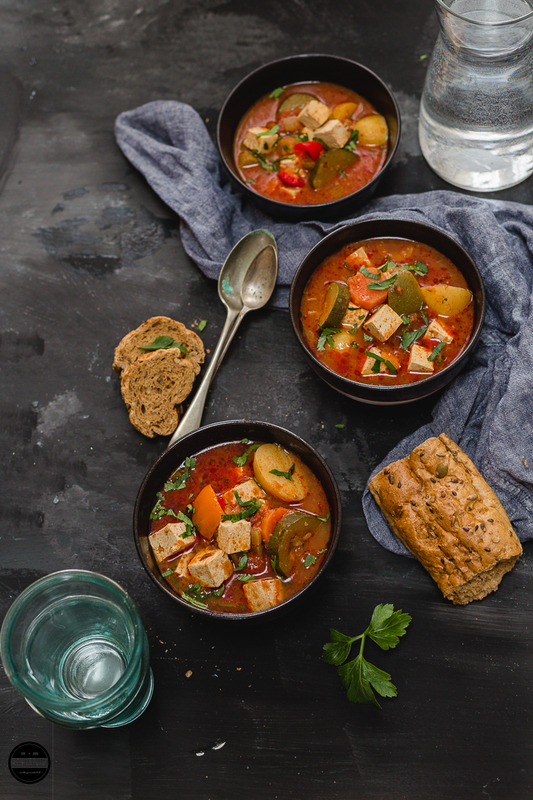 You can add smoked tofu in this stew. If tofu is not your first preference, use kidney or cannellini beans instead. 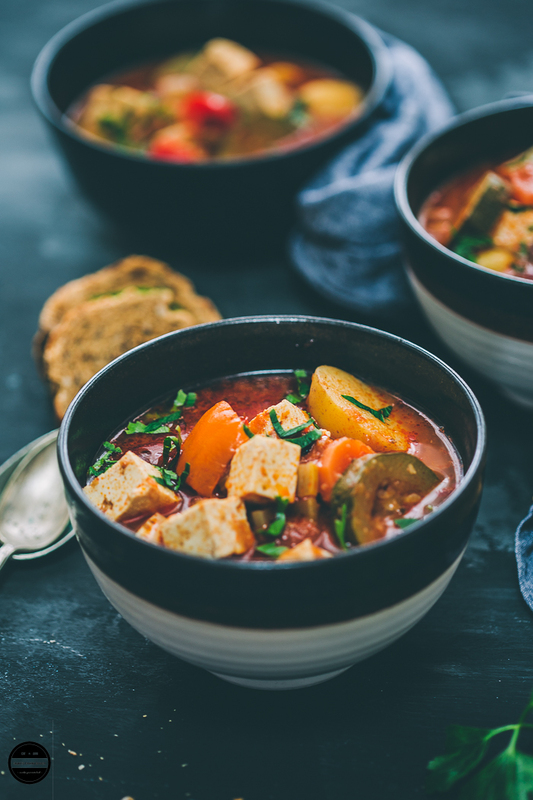 Vegan Hungarian Goulash, a hearty, delicious and easy to cook a dish that you are sure to enjoy! In a big pot heat oil and add bay leaves.Then add chopped onion and garlic.Saute the onion and garlic until little pink. Add all the vegetables with paprika, salt and pepper.Mix everything then add plain flour and cook the mixture 3-4 minutes.Add tomatoes and tomato puree, herbs and mix well.Now add vegetable stock and cover the pot with the lid.Let the stew simmer for 20-25 minutes, then add tofu and let the stew cook another 5-7 minute.By now the stew will get little thicker.Once the Goulash is ready. serve in a serving bowl garnish it with parsley. Serve it with crusty bread or pasta.Enjoy! Vegetarians are really very innovative in creating new dishes.. Looks yummy. Look at the colour, lovely. This looks awesome Jagruti. I can feel the taste. Thanks Sujata for the lovely comment. This looks like a hearty dish that is just layered with flavors. I have never tried making a goulash before but this looks like something I can do. Thanks Vicky! Hope you like it. YUM YUM YUM!!! I want to try this recipe for dinner and I'm sure it is very tasty! Looks incredible! Very interesting combination of ingredients. Thank you for sharing this great recipe! 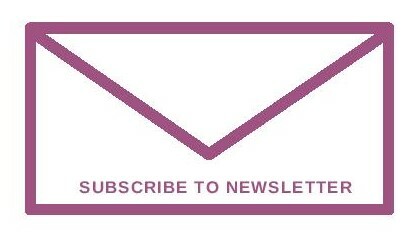 Pinned for later! Thanks Veena for the lovely comment and RE-PIN. I am sure you are going to like this dish. this looks so tasty! i'm always looking for more vegetarian meals! thanks! One of the many, many side-effects of reading voraciously is to read about various iconic foods. Goulash is so emblematic of Hungary, but I have never tried it because of the meat component. Now that I have your recipe, I will try this version. I'm always in awe of your pictures, simply adore them! This looks so good, makes me want to try it asap! I have never had the opportunity to try a goulash before. Your easy and healthy recipe with wholesome ingredients looks like a good place to start :) :) Awesome share! Gorgeous images and kudos for coming back home and taking that challenge of converting the dish into vegetarian with tofu and the paprika. Travels and trysts with locals always give us back something to learn and usually inspire us to blog something super! Clearly in your case, with so many vegetables added in that silky tomato broth, this must have tasted spectacular with the crusty bread. Oh my gosh....Look at the riot of colours...Loving all the flavours going on in the dish....You have captured the dish so well that it's tempting me to dive into that bowl...Great share!! I am just in love with the photograph <3 So eye-catching !! OOOOOOOO! That happens to be the shape of my mouth! Yes its wide open unfortunately I cannot get any of this yum in my mouth via the screen. Will try making this in the rains. Just right when the veggies look so delicious and you are home out off the drenching that happens to be Goan rains! 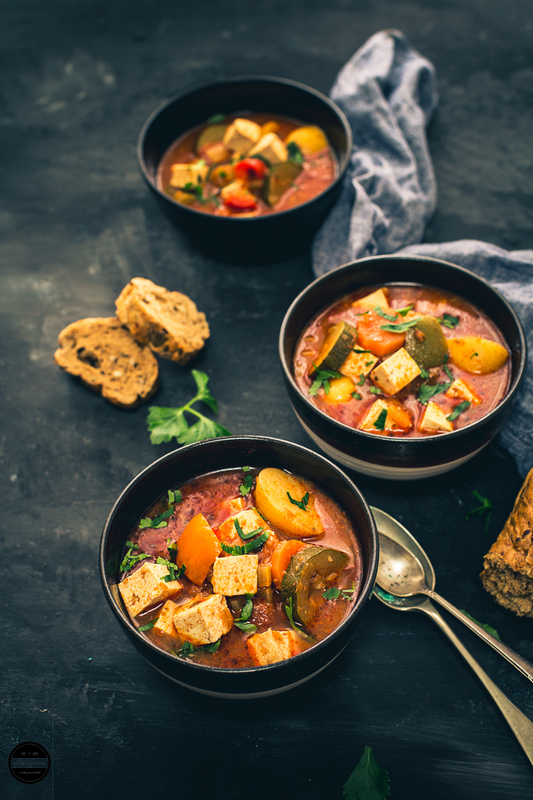 My family is a huge fan of chunky veg soups or stews and they love tofu too, so this is a win win for me. I am so going to try this hearty and comforting Hungarian Goulash real soon. Love the beautiful pictures Jagruti, as always they kind of steal my heart. 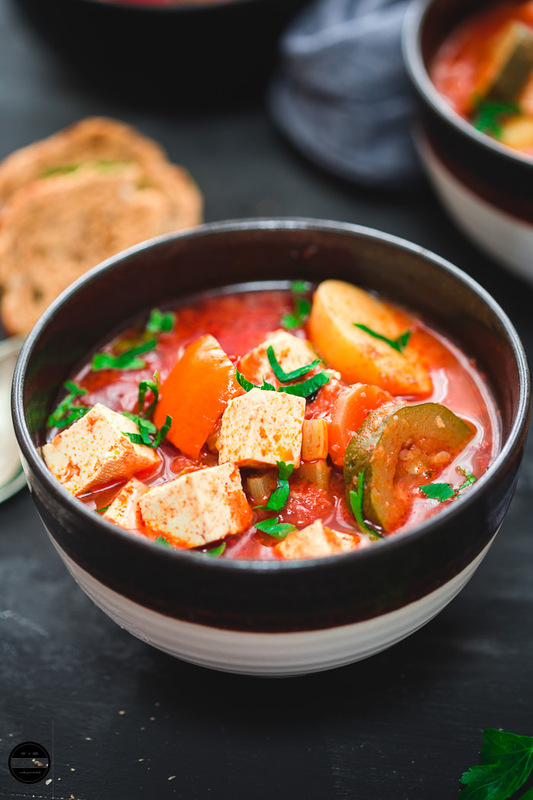 I love the flavours in a goulash and think it's great that you've created a vegan version. The pictures are just beautiful too! This goulash looks wonderful! I wish I had a bowl right now! this looks lovely and comforting! also so glad you created a veg version! i have never had it because it usually has meats I don't eat! Gorgeous photos! This goulash so hearty and delicious! This is great, I totally agree with you, Goulash is perfect any time of year. With the tofu you don't get that heaviness that you do with beef. Brilliant! I haven't explored much vegetarian options from world cuisine. this one looks seriously tempting! This is just mind blowing post Jagruti. The pics are so tempting that i am desperate to try this soon. 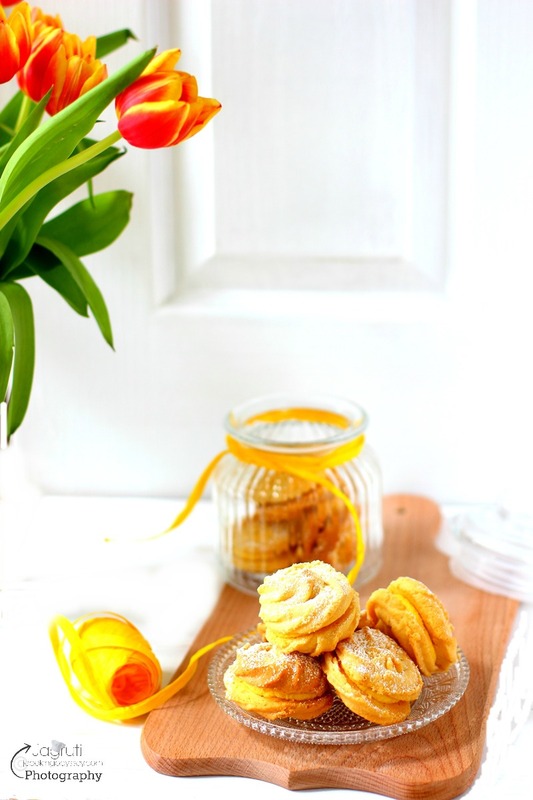 Bookmarking this wonderful recipe.